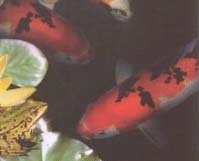 If you feed your fish according to their needs with JBL PRO NATURE CONCEPT and take care of your pond following the advice given in this brochure, you should have no reason to worry about diseased fish. Just to be on the safe side, we would like to look at a few common diseases in more detail. Of course, given the limited space this cannot be a complete review of all the fish diseases, which can occur in a pond. In principle fish in the garden pond can suffer from the same diseases as fish in the natural waters of our latitudes. If fish suffer from diseases, this is usually a sign of inappropriate conditions, of imbalanced nutrition, lack of vitamins, stress due to the wrong combination of species or similar reasons. Therefore if diseases occur, you should look carefully at the feeding habits and the conditions in which the fish are kept and improve them according to the advice given in previous chapters. A disease which is easy to recognise and usually also easy to cure is the so-called �white spot disease� which is caused by the single-celled parasite ichtyophthirius multifilius. This parasite regularly attacks fresh water fish all over the world and is well known to aquarium-keepers under the short form �ichthyo�. Small white dots, the size of a pinhead, on the skin and the fins of the fish are the easily identified symptoms of this disease. In addition the fish rub along stones, plants etc. The disease is usually easily cured using JBL Medolon. Quite often success is already evident after only two days. Should this not be the case, change the dose according to the instructions for use. Once treatment has finished, JBL AccliPond added to the water helps the fish to get over the stress, which the treatment has caused. JBL Bactolon adds new, beneficial cleansing bacteria, which might have been harmed by the treatment. Important: During spawning time in spring, gold-fish often have a �spawn rash� which appears in the region of the head and is very similar to ichthyophthirius, but is harmless and should not be confused with the disease. Unfortunately more and more very annoying diseases caused by bacteria have been occurring recently. Carp (goldfish, koi, and others) in particular have been affected. These diseases occur mainly in spring, when the fish are weakened from over-wintering. For this reason feeding according to the PRO NATURE CONCEPT by JBL is also very important during the cold season as a precautionary measure. Open, ulcerous ruptures suffused with blood are usually the symptoms of these bacterial infections. Distended stomachs can sometimes also be observed. As soon as the first symptoms of this kind are noticed, the affected fish should carefully be caught and treated with JBL FuraPond in a separate quarantine tank. FuraPond is very quickly absorbed into the internal organs of the fish, an important factor for successful treatment. Treatment should only take place in the pond in exceptional cases, as JBL FuraPond also kills the beneficial cleansing bacteria. After successful treatment, AccliPond helps the fish to get over the stress, which the treatment has caused. If the treatment has taken place in the pond, it is vital to reintroduce cleansing bacteria by adding JBL Bactolon.